Water always finds a way to damage properties in any season, including winter. 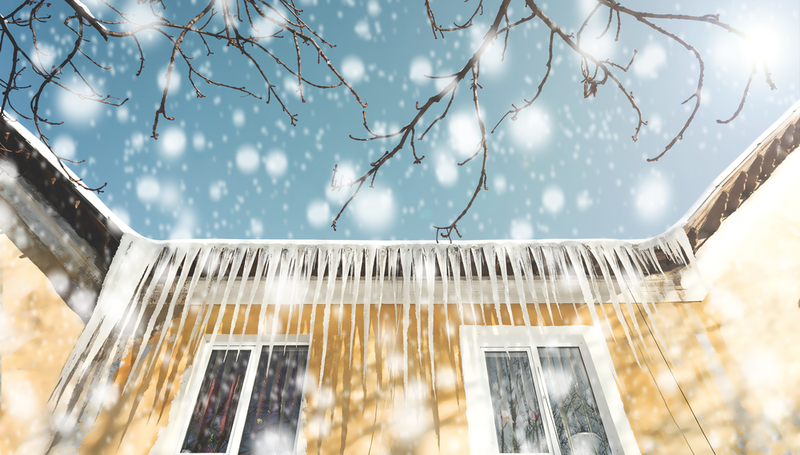 During the cold season, uninsulated water pipes can freeze and burst, and ice dams can form on roofs. Moreover, thawed snow can enter the basement, causing flooding and, thus, water damage. Here’s what property owners can do to prevent winter water damage in their homes. Water pipes should be insulated in unheated areas – the crawl space, basement, garage, attic, and under kitchen and bathroom cabinets. Warmer air should be allowed to circulate around the plumbing by opening kitchen and bathroom cabinet doors. The products stored in these cabinets should be moved up, out of the reach of children and pets. Cold water has to be allowed to drip from the faucets served by exposed pipes. Running even a trickle of water through pipes helps prevent them from freezing. The thermostat should be set to the same temperature during the day and at night. While the heating costs may rise, pipes will be less likely to freeze and burst. When leaving home for a day or more, homeowners should set the thermostat to at least 55° F. Also, the water supply and drain pipes and appliances that use water should be shut off. In addition, a trusted person should check the home once a week. The snow on the roof should be removed when it’s about 15 centimetres deep. To remove the snow without a ladder, it’s best to use a roof rake or a long-handled brush. Downspouts must be kept clear so that melted water can drain properly. Insulating the attic to prevent warm air from entering. Warm air can melt the snow on the roof, which refreezes, forming ice dams. Ensuring the attic is properly ventilated. Warm air should escape through vents near the top of the attic. Cold air should flow in through vents near the eaves. Installing a water membrane underneath the roof shingles. It helps prevent water from seeping in. Installing a snow shield to prevent leaks. The shield goes under the shingles starting from the low edge of the roof and extending up at least one metre inside the exterior wall of the house. Installing gutter screens to help keep out the debris that causes build-up and damage. Water leak detectors should be installed anywhere a water problem may occur, such as on sump pumps, near water-bearing fixtures, and behind or beneath pipes. The water supply lines should be checked annually for leaks. Appliances that can leak include the hot water heater, washing machine, ice machine in the refrigerator, and more. Property owners should purchase sewage back-up coverage. Heavy rains and melting snow can overload the stormwater system, causing water or sewage to back up into the home. Outdoor hoses must be disconnected when not in use. This prevents water from freezing in the line, creating a blockage that can cause backflow. The snow around the home’s foundation should be cleared. Melting snow and ice can cause leaks in vulnerable areas of the foundation. To help prevent winter property damage in the future, here’s how to prepare homes for winter and how to protect roofs from snow and ice dams. The PuroClean team stands ready to provide professional restoration services to any property affected by fire, water or mould damage.